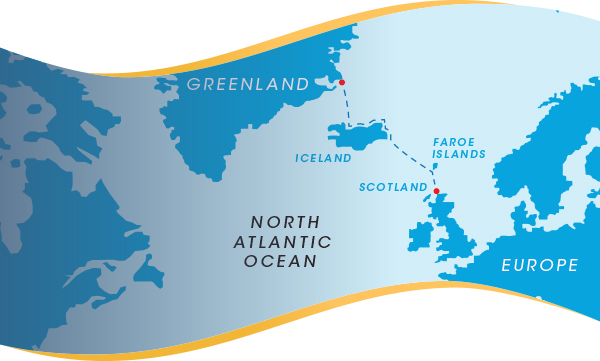 In this issue of the Tentipi Blog we’re embarking on a most unique adventure, taking us by kayak from the icy shores of Greenland, across the north Atlantic to the cost of north Scotland, 1200 nautical miles (2200 kilometers) from the starting point. 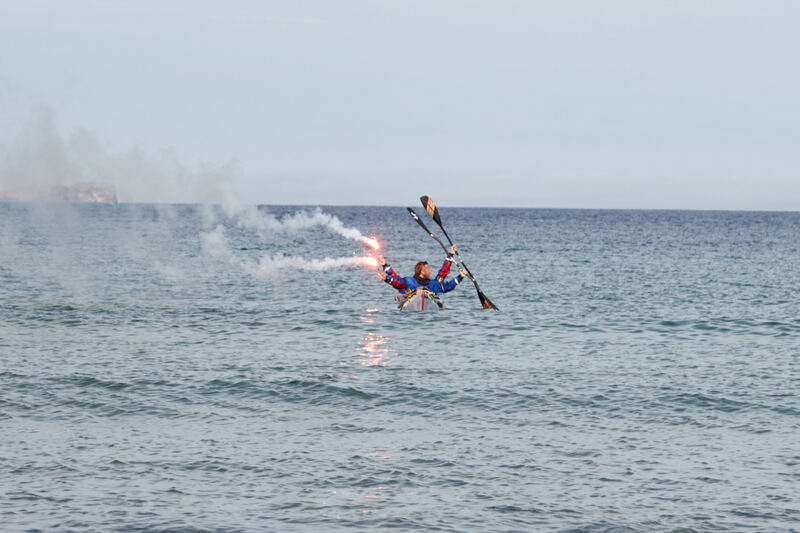 Host for this epic journey is british adventurer Olly Hicks, at age 23 he was the youngest person to row solo across the Atlantic Ocean from the USA to England and has since then pursued this world conquering lifestyle. 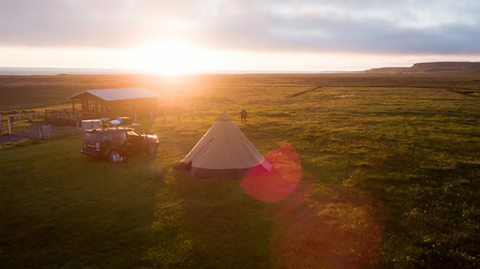 For his latest adventure, Tentipi provided with a Safir 9 and an Eldfell wood burning stove to keep the video/photo team that followed Olly warm and sheltered in these arctic conditions. Alright, off we go! It’s 0515 in the morning, we are 70nm offshore in the North Atlantic Ocean, the morning sun is threatening to rise above the horizon and we have been paddling our 26ft long kayak for the last 30hrs, non-stop. We are exhausted, hallucinating and our own survival hangs in the balance. In 1728 an Inuit man arrived on a beach in the North East of Scotland, near Aberdeen. He was wearing full seal skin clothing, paddling a traditional Greenlandic skin-on-bone kayak and carrying all his hunting gear. 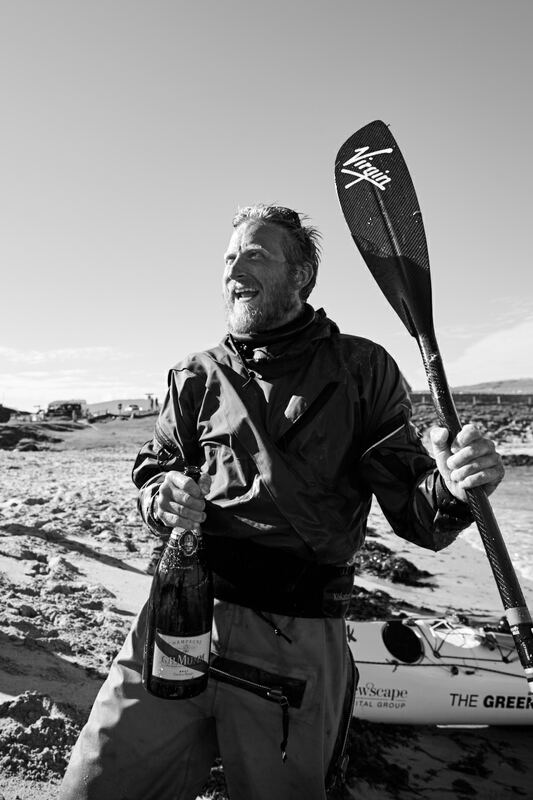 He died 3 days later… Up until now nobody knows how that man got there, whether he did indeed paddle 1,200nm from Greenland or whether he came via other means! This is what we set out to unearth or at least add speculation to the fact that he might have paddled the entire way. As we lowered the kayak into the water at the Greenlandic ice-edge, there was a mixture of emotions, from the fear as to what lay ahead of us, to excitement at the thought of experiencing true, unbridled adventure. We were about to do something that no human has ever attempted – potentially(!) and the stakes where high, very high! We lived in the kayak, resting and paddling both at the same time barely an inch above the burningly cold ocean water which was black like the inside of a cave and made your hands flinch with every touch and left me questioning what animals could survive in such Arctic temperatures. 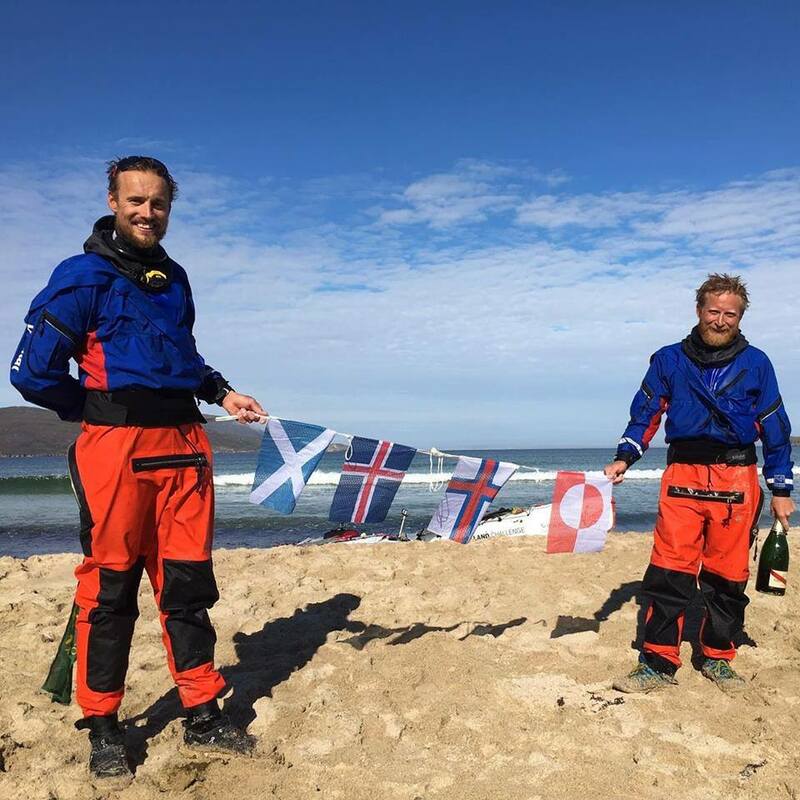 Dressed in nothing more than a dry suit and a fleece base layer we battled against the unforgiving ocean weather until after 46hrs paddling we arrived on a beach in NW Iceland. Hardly able to stand upright, we staggered to a fresh water stream and collapsed into it. 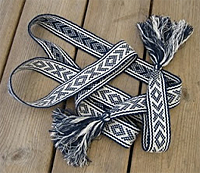 Life on board the kayak is beyond difficult – completing the simplest of tasks seems to take hours. Cooking hot meals was one way of mitigating our largest risk: hypothermia, but as you might imagine cooking at sea is difficult, cooking in a kayak at sea is almost impossible. 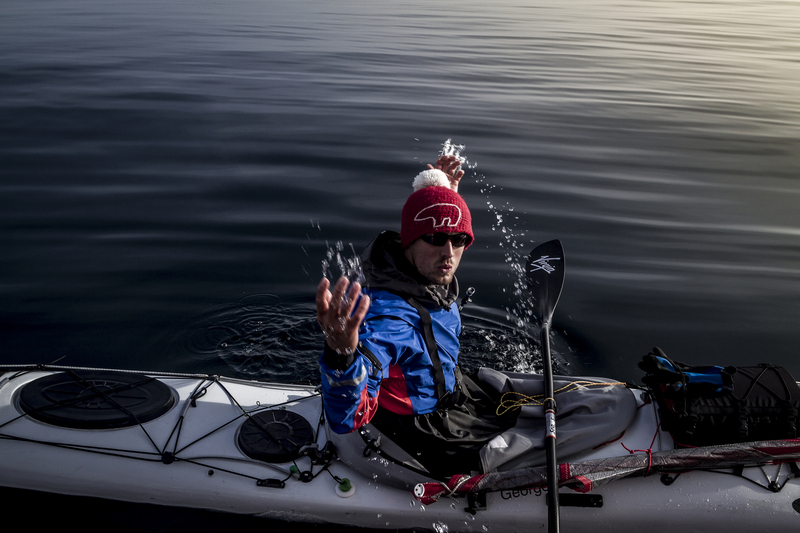 The following two weeks consisted of paddling 600nm between headlands around the north coast of Iceland. Not only did we pass some of the most majestic fjords and mountains, we also met some incredibly generous and welcoming people before arriving at our last stop before heading across the ocean to the Faroe Islands. From Iceland to the Faroes was our longest and most dangerous stretch of open ocean famously called ‘The Devils Dancefloor’. There is no support boat next to us, so once we leave land we are committed, we have everything we need to exist from loo paper to fresh water. This leg could take us up to a week and of course, weather forecasts aren’t that accurate that far out – hence the danger. If the weather changed for the worse, we had nowhere to hide. 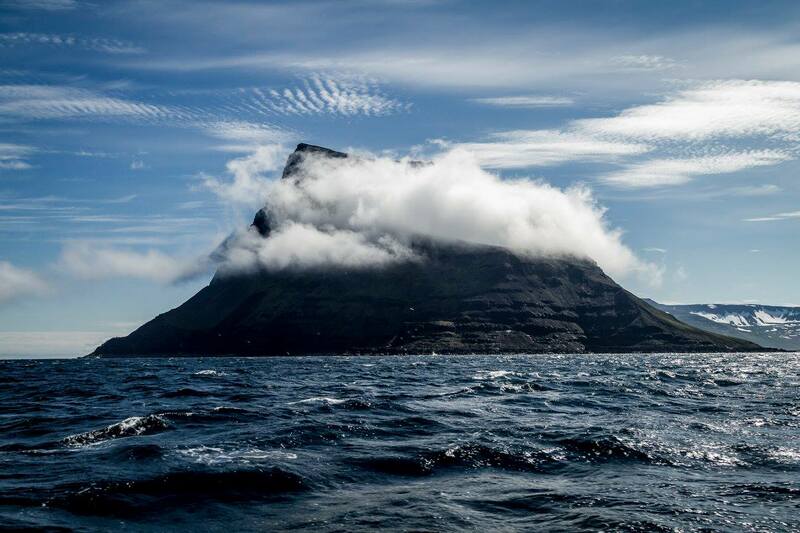 Famed for its steep cliffs falling straight into the ocean, arriving into the Faroe Islands was a moment we will never forget. From 240nm out we were aiming for a 500m wide entrance to the main channel that runs down the centre of the island. Currents flow at up to 8kts through the islands so the waters can be exceptionally turbulent around here. 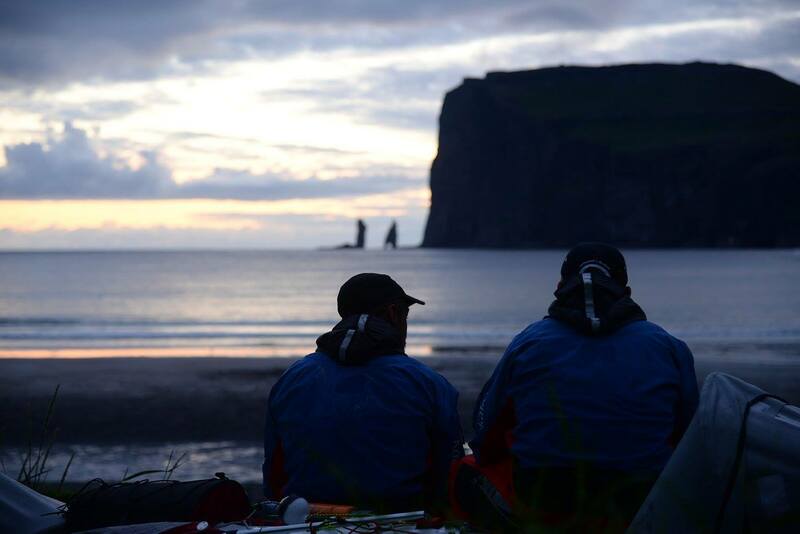 We arrived at 0300hrs as the sun was about to rise surrounded by vast cliffs and a still, unmoving ocean. We hit the beach, crawled out of the kayak and were simply relieved to have dry land beneath our feet once again. We had been away from home for almost 2 months and the summer season was drawing to a close. Our weather windows were not only getting shorter, but they were also becoming less frequent. The weather was our dictator; it was the only factor that would determine whether this expedition was possible or not. 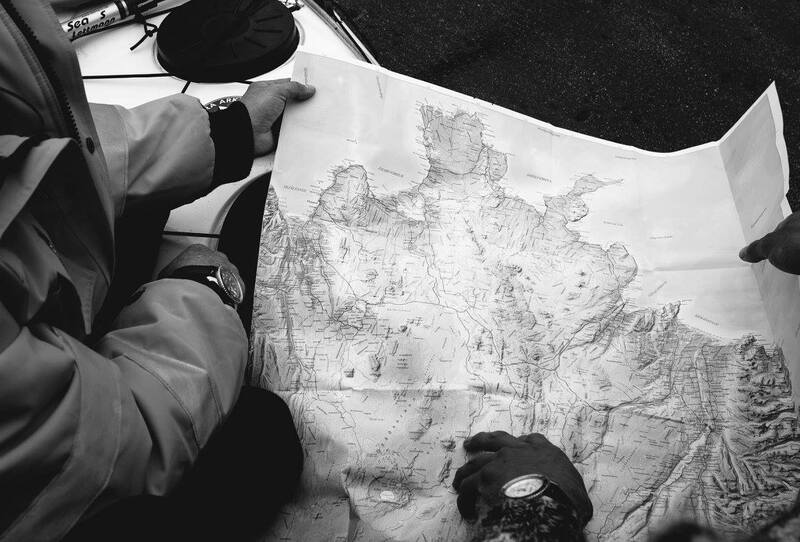 Indeed, our first attempt to cross the Devils Dancefloor saw us join a passing fishing vessel on day 3, 50nm offshore and head back to the mainland – an adventure in itself. 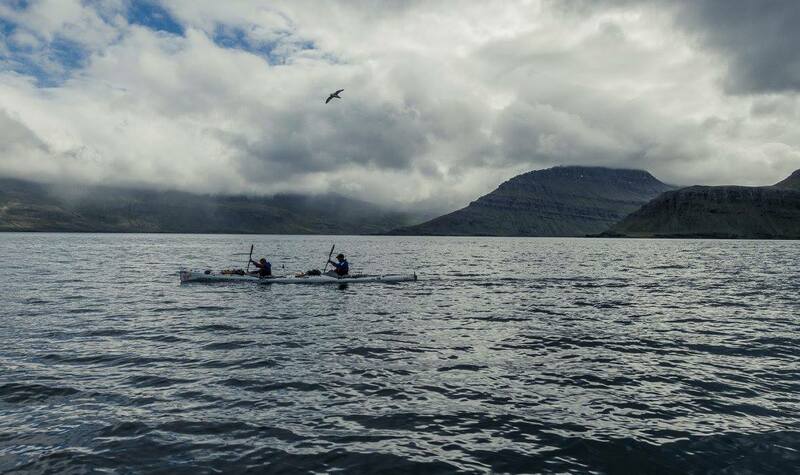 Three weeks of waiting and after one false start, there was a narrow chance that we could leave the Faroes and make for the Scottish mainland. The window was tight so the island of North Rona (45nm NW of mainland Scotland) seemed like a great place to stop… but we had to get there first. 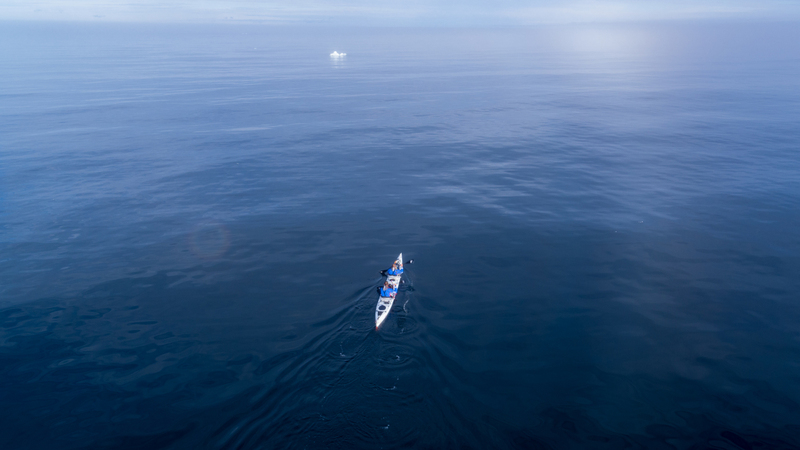 It’s 0515 in the morning, we are 70nm offshore in the North Atlantic Ocean, the morning sun is threatening to rise above the horizon and we have been paddling our 26ft long kayak for the last 30hrs, non-stop. We are exhausted, hallucinating and our own survival hangs in the balance. We simply had to sleep, but would the weather close in around us? With only a matter of minutes to spare before gales ensued and the ocean turned into a fury of white horses, we landed at North Rona – hard ground couldn’t have come sooner. North Rona is a deserted island with no running water, so having got there, it was then a game of survival. Collecting fresh water from the roof and hunting sea birds was how we survived. As to whether the Finman did paddle the entire way…? We feel that there are other, more plausible ways that he might have ended up near Aberdeen. 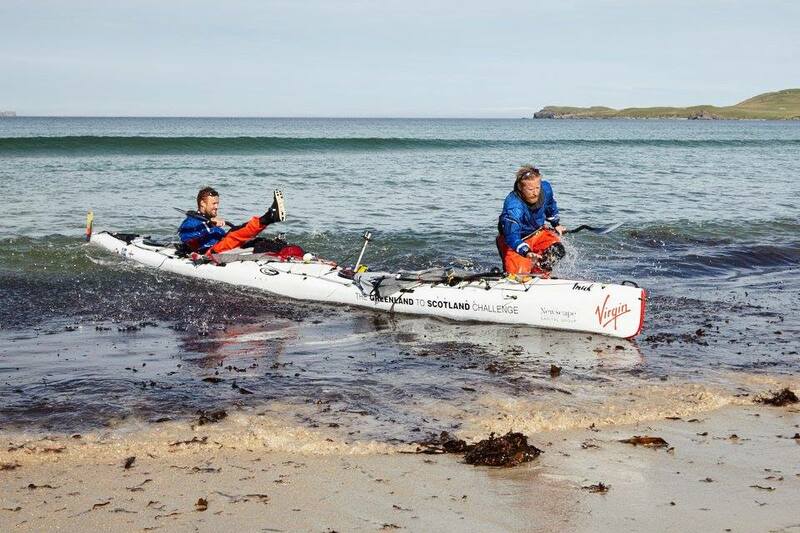 For example, he might have been picked up by some Whalers and dropped offshore when he fell ill.
Sixty-six days after leaving the coast of Greenland, we paddled silently into Balnakeil Bay, N.Scotland having done something that potentially no human had ever done before and if they have any sense, would never do again!